Bioengineered rat kidneys have successfully produced urine both in a laboratory apparatus and after being transplanted into living animals. The Massachusetts General Hospital scientists behind the breakthrough believe that with further work, bioengineered kidneys could someday replace donor kidneys. In Nature Medicine, the research team describes building functional replacement kidneys on the structure of donor organs from which living cells had been stripped. Importantly, the new approach would remove the need for immunosuppressive drugs, which pose many health risks and cannot totally eliminate the incidence of eventual organ rejection. The new technique involves stripping the living cells from a donor organ with a detergent solution and then repopulating the collagen scaffold that remains with the appropriate cell type – in this instance human endothelial cells to replace the lining of the vascular system and kidney cells from newborn rats. 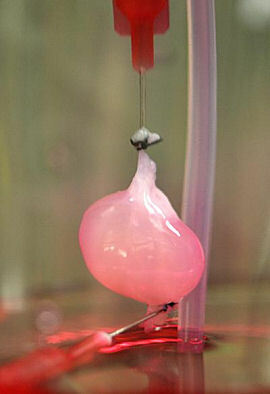 The research team first decellularized rat kidneys to confirm that the organ’s complex structures would be preserved. They also showed the technique worked on a larger scale by stripping cells from pig and human kidneys. Making sure the appropriate cells were seeded into the correct portions of the collagen scaffold required delivering vascular cells through the renal artery and kidney cells through the ureter. Precisely adjusting the pressures of the solutions enabled the cells to be dispersed throughout the whole organs, which were then cultured in a bioreactor for 12 days. The researchers first tested the repopulated organs in a device that passed blood through its vascular system and drained off any urine, which revealed evidence of limited filtering of blood, molecular activity and urine production. Vintage Purple Frank's Safe Kidney & Liver Cure * Wheaton Bottle *Rochester N.Y.